Long underappreciated as an abstract painter, the African-American artist Norman Lewis (1909-1979) received an inspirational homage from ten Philadelphia dancers at the Pennsylvania Academy of the Fine Arts (PAFA). Their on-site responses to the retrospective exhibition, “Procession: The Art of Norman Lewis,” were a revelation: art is of a universal sublime, not of a fixed genre or medium. Lewis, a largely self-taught artist, was influenced as a young man by the African art he saw at the Museum of Modern Art as well as by the cross-currents of European and American modernism, including the work of Wassily Kandinsky. His work has no clear linear development nor signature style, and he refused to be confined by the expectation that a Black artist should embrace social realism. His multiple styles in different media are visually compelling hybrids of abstraction and figuration, punctuated with calligraphic lines, fragmented markings, and vivid colors—achieving, in later years, a spiritual transcendentalism. 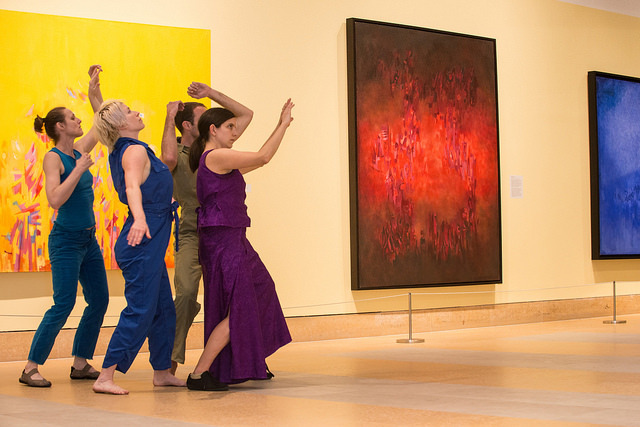 Graffito Works’s dancers themselves manifested Lewis’s merged abstraction and figuration, and this elusive combination proved the most intriguing and mystifying aspect of the improvisatory dance at PAFA. Set for five PAFA galleries and spaces and to an open score by Asimina Chremos (who also danced), this Procession offered different configurations of performers moving in a counter clockwise cycle through gallery spaces, providing a rich continuum of movement with occasional stasis and silence. Seduced by these cycling rhythms, I was able to make new discoveries, re-experiencing Lewis’s work through different dancers. 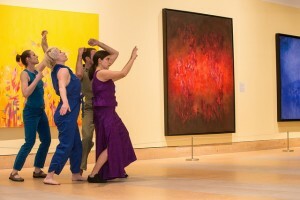 Lewis’s paintings were translated into three dimensions by the dancers’ animated monochrome color costumes—yellow, orange, blue, purple, teal, rust. The space within the paintings and within the galleries resonated with life. Lewis’s linear processional motifs, suggesting parades, celebrations, and protests, found mirrors in the snaking and variegated flow of dancers, and in audience members forming their own processionals in more random cycles. Dancers emerged or exited to form solos, duets, trios, or a quintet (the latter grouping, dubbed the Love Army by Chremos in notes to dancers shared with this writer, was always set in the large entranceway atrium). The most memorable transition was Marion Ramirez’s serpentine exit from one gallery, locomoting on her stomach with a centipede’s speed and craftiness. Although there were plentiful moments of delight amongst all the dancers in these various settings, the first gallery, titled Looking at Art and containing Lewis’s earliest work from the 30s and 40s—Harlem cityscapes and MOMA’s African art offerings—was of particular interest as the site of rotating improvisational solos. These early pieces provided a grounded space where the audience saw the artist struggling, searching, discovering, creating. Here Meg Foley spun wildly in circles, and pierced the spaces around her with sharp diagonal reaches of her arms, immersed in her own reverie. Later in the same space, Chremos assumed calmer, more contemplative states with reduced but precise movements of her torso and arms, alternating with silences. Jung Woong Kim, animated, fluid, and the source of guttural vocalizations in other galleries, here stood gazing eye-to eye with Lewis’s 1940s Head, a striated black-and-white plaster of Paris with red eyebrows and red markings within the eyes. Then Kim sat still on the floor, head bent, submerged in silence, before a figure in a painting, The Wanderer (Johnny) (1933), equally silent and desolate—his face entirely covered by an old bent hat, highlighted by white reflections of the surrounding snow. The performance was sufficiently infectious that two four-year-olds, Ilene Jollimore and Davina Isa San Angel (whose mothers did not hesitate to offer their names upon request) said that they “wanted to make their own dance,” and with abandon joined the procession-making. Their creation, also site specific, was largely confined to a black leather bench around which they did X rolls and other moves as much YouTube-generated as Norman Lewis-sourced. The other outstanding dancers were Lee Fogel, Loren Groenendaal, Beau Hancock, Megan Mazarick, Jenny Sawyer, and Zornitsa Stoyanova. Joining the cycling dancers was also the one-man band of Julius Masri who provided supportive soundscapes heard both throughout the galleries and within individual galleries via flute, a small drum set, and electronica from Casio SK1 keyboards.